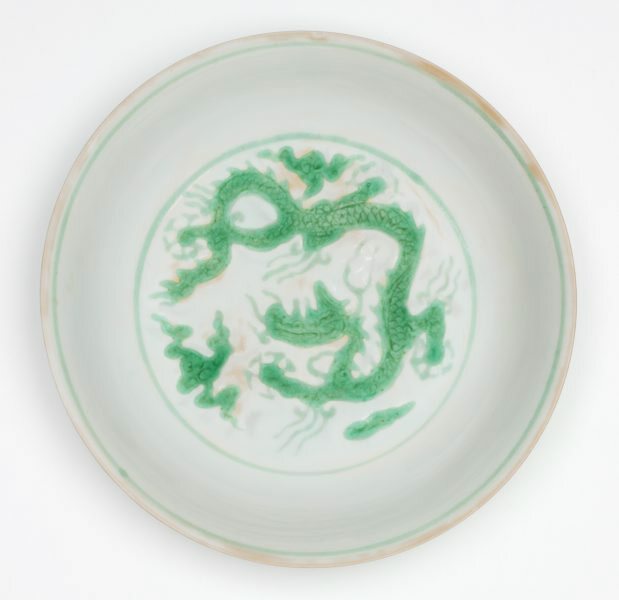 In the centre of the plate’s interior is a five-clawed, descending dragon, its mouth closed. Three patches of swollen clouds are used to decorate the background. The exterior is decorated with two relatively simple five-clawed dragons. The bodies of the dragons are enamelled on the biscuit (the unglazed clay), with so called 'an hua' or 'secret decoration' of wave and rock patterns barely visible beneath the white glaze on the walls of the dish. This green enamelled ware with a white ground is distinctive of the Zhengde period.